This particular correction bit is made of Copper Barrels & Black Iron Shanks and will provide maximum durability even when used on a daily basis. 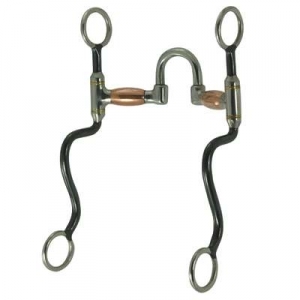 All the correction bits that we offer are high-quality horse accessories. The copper barrels will also help with the horses salivation making it more convenient for him. This correction bit comes with copper barrels & Black Iron Shanks. This item has 9'' S Black Iron Shanks and copper barrels.